Is your home keeping up with your changing lifestyle? Should you continue to invest in your home as you get older, or are there other options? 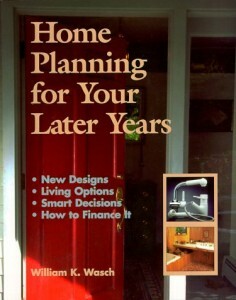 This step-by-step home assessment and planning guide for middle age and older adults includes practical and applied tips on how to evaluate where and how you want to live when you retire and what housing needs you can anticipate. Stay put and modify, or move and build? Choose a single-family dwelling or join with friends in shared housing? Invest in a continuous care retirement community or pay rental fees plus long-term care insurance? Evaluate design ideas to meet your needs and familiarize yourself with the latest in hardware, appliances, and cabinetry.